The WAVES travelled aboard an L-S-T ship, or troop transport ship. 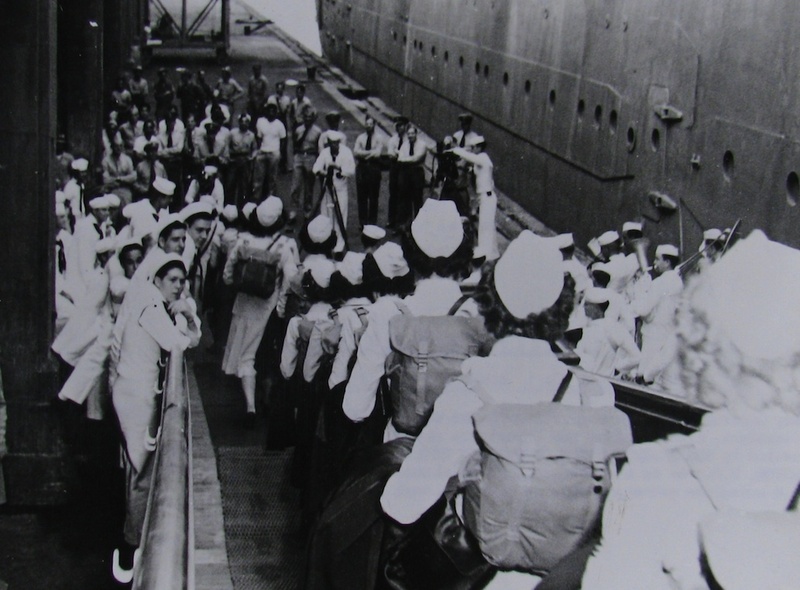 It was mostly women aboard – the only sailors were the crew. It was fun being aboard ship. We did zig-zag, we could see where we zig-zagged. Didn’t need to, but taking precautions, I think. This was early in ’44 — no later in ’44. But anyway, a couple of the girls fell in love with the sailors. That was the disease, I think, with the women, with the sailors (laughs). Away from home. We had a good time aboard ship. We didn’t have any rough weather, I didn’t get seasick. This photograph shows WAVES leaving their ship in Hawaii. It comes from the National Archives.